Doncaster Knights saw their outside hopes of topping Pool 2 in the B&I Cup, which would have guaranteed them a place in the quarter-finals, dashed when going down 37-32 at home to Bristol. 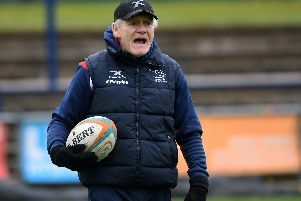 Despite feeling that his side had generally defended well, Griffiths was critical of the fact that his side had ‘gifted’ Bristol two of their four tries with interceptions. He also claimed that wing Tom Varndell’s first half-try should have been disallowed for an infringement at the turnover. Griffiths had hoped to secure the club’s position in the knockout stages ahead of the testing trip to Leinster A and fielded his strongest available side. Bulumakau’s absence, and that of Will Owen who recently had a routine knee operation, gave Griffiths the opportunity to give a debut to Namibian international Lesley Klim. “He’s only been with us a matter of weeks but I thought he was one of our shining lights,” said the Welshman.